Does your horse turn on a dime - or does he just sort of veer off in the opposite direction, looking one way while his feet carry him another? Do you ask for a right turn - and feel the horse continuing "in a glide pattern" to the left as if a plane crabbing off course? Does your horse turn precisely or does it tip you in the saddle and drift off his path? Here's how to fix dropped shoulders and get quick turns. Does your horse stay upright through his turns, carrying his shoulders (and therefore, you) in a balanced frame? Or, does he dip a shoulder as if a race car spinning through a hairpin, causing you to have to repeatedly shift uncomfortably in the saddle to retain your equilibrium? Here's a quick fix you can employ this very day. But first, a little theory. Extend your left arm out fully in front of you at shoulder level. Think to yourself "I want my arm to move to the right." Take your right index finger and try to position your arm for the turn by pushing your left wrist to the left. What will happen is that your arm moves to the left, the hand and wrist trail, pointing off to the right. This is your horse when it looks to the right (due to rein pressure) while continuing to glide to the left. When you push your wrist, it represents you picking up the rein, trying to turn the horse as we have done traditionally, that is, from the front (trying to turn the whole horse by turning his head and neck). Now, take your right index finger and push your left elbow to the left. Your elbow will move around to the left (think "the horse's hips), the hand (the horse's head) will be pointed the right way - and the horse (your arm) has little choice but to move in the correct direction. It's just the same as a boat when it turns. The rear end does double-duty, both turning and powering the movement. From now on, then, as you ride be cognizant as to whether your horse is turning tightly as if on a track - or if he's sliding out. The moment you feel this "slop," take the rein (the right one when moving toward the right) and ask him to turn those hips in an exaggerated fashion, holding off on your release until the hips come around a good 180 degrees. (You may need to take the rein towards your opposite shoulder - or you may find success by carrying the rein lower and pulling his nose toward his hip. Experiment.) This correction is the same as saying "If you're not going to turn a little right, turn a whole lot right." It's work to move his body around like that (think of the momentum and physics involved), so he'll begin turning much more sharply. Remain business-like and relaxed. If sloppy turns are a true issue, then work on serpentines daily for twenty minutes each day, being sure to drop the reins and take a mini-break before picking the reins back up and turning off the other direction. Employ your fix any time you feel that him "blow through" the turn. ​To address "dropping shoulders," you will do something very similar. First do this quick exercise yourself: Stand up and move your feet away from each other by as wide a spread as you can safely manage (as if you're going to do jumping jacks, but more exaggerated). Next, step your outer leg around the inner leg as if a compass tracing a circle in geometry class. Not easy, is it? Try bringing your "outside" foot in close to the other foot and then stepping around. Much easier, right? There's an easy way to do something and there's a hard way. 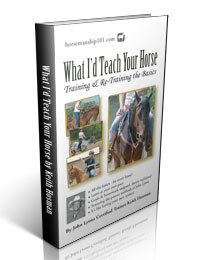 Your fix for your horse's drooping shoulders lies in you teaching him that concept: He can turn the easy way - or the hard way. The next time you're riding and your horse "drops a shoulder" through a turn, (it feels like the saddle's slipping off to the side) he's out of balance and "laying over" and that's the "hard way." We will make this hugely apparent to him when he tips by immediately asking for a full 180 degree disengagement, just as you did in the riding exercise to cure sloppy turns, above. (That is, if you feel him drop a shoulder you should immediately ask for the hips to turn a full 180 degrees before continuing on your way. Ideally, the inside shoulder will stop briefly as he pivots over it. Think "turn on the forehand.") Be quick to get back up to speed and on your initial pattern just as soon as he completes the hips-over movement. Stalling out is death: It is vital that this entire sequence (before, during and after) be as fluid as you can make it. He may very well "be all sloppy" through this tight turn as well at first. However, it won't be long till he realizes that he can complete this sharp turn more easily if he stays upright - and then it won't be long before he realizes he can avoid doing the sharp turn altogether if he simply stays upright though the initial, larger turn. If you feel him especially difficult to turn in this tight fashion going one particular direction (eg, the left), then your correction might be to ask for a disengagement to the right - even when first traveling to the left. This will avoid the diversion of a fight; it'll keep your "fix" on track - and, if we cause the horse to stand upright, that's all we were really after. As before, get going back on your initial circle/arc as quickly as possible. Stall-outs will kill you.